In Gunmen of the Apocalypse (Season 6, Ep 3), cult Sci-fi TV Series Red Dwarf visited Kent. The crew of Starbug intercept a battleship carrying murderous cyborgs called “Simulants” which infect the Starbug with a virus. Kryten (Robert Llewellyn) deliberately infects himself with the virus to find an antidote. 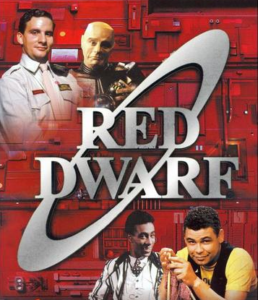 Rimmer (Chris Barrie), Lister (Craig Charles) and Cat (Danny John-Jules), end up in the computer simulation of a Wild West town, facing four outlaws, the Four Horsemen of the Apocalypse, whom they must defeat. The episode stars Chris Barrie (Lara Croft: Tomb Raider), Craig Charles (Coronation Street), Danny John-Jules (Blade II, Death in Paradise), and Robert Llewellyn (Mirrormask) star. Red Dwarf Gunmen of the Apocalypse was first shown on television in 1993.